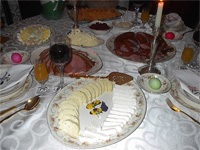 This may not part of a true Polish Easter Brunch, but's it's something that has been made for any special occasion in our family since back in the 70's. My Mom had gone to visit a cousin in Atlanta Georgia, and came back with this great new cocktail. Once we tried it, it's become a must for all the Holiday Meals. This is the version that I usually make. 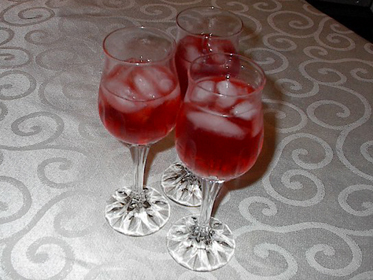 The Cran-Ras has more flavor and you put enough of the brandy in so that you can taste liquor. No matter how big a batch you make remember that this version uses 1 part Southern Comfort to 2 parts Brandy. If you don't seem to have enough liquor in it add a little more Brandy. Just make sure you keep track of everyone drinking this because it will definitely sneak up on you. 1. This is made in the pitcher of the blender and poured directly from it. 2. Fill about 1/3 with crushed ice, then to 2/3 line with Cran-raspberry juice. 3. Add liquor, about 1/3 cup of Southern Comfort and about 2/3 cup Brandy, plus the juice of about 1/2 a lemon. There should be enough booze in it so you can barely taste it. 4. Blend at high speed until it's foamy. Then place some ice cubes in fancy glasses, rub the rim with a lemon, and serve. This could be garnished with a sprig of mint.